“The ache for home lives in all of us”, as was said by writer Maya Angelou. This ache is the prospect facing and lived by 40 lakh odd residents of Assam today. 40 lakhs of the residents in Assam do not find their names on the final draft of National Register of Citizens (NRC) published by the government on 31st July. The Supreme Court had ordered that the NRC of 1951 is to be updated. This updation was deemed necessary to detect illegal migrants who are living in Assam and come from the porous Indo- Bangladesh border. CSSS had conducted a fact finding into the process of NRC updation in 2010 due to apprehensions that the process of updating may not be fair and result in the non inclusion of Muslims and Hindu Bengalis. Also there was a comprehensive historical account related to this issue given by Shahiuz Zaman Ahmed in “Denial of Citizenship Rights and Marginalization: Linguistic Bengali and Muslim Minorities in Assam” and published by Institute for Peace Studies and Conflict Resolution. The author here will be reproducing relevant excerpts from these two publications to illustrate the arbitrary nature of the updation and implications on the people in Assam especially for those who have to pay a devastating price of being rendered stateless. The process is designed in a way where it is difficult to prove one’s citizenship. These flaws are meant to be discriminatory towards the Muslims in general and Bengali Hindus in specific. The excerpts point out to how the central politics to the NRC issue is exclusion, xenophobia and hatred against the “outsiders”- Bengali Hindus and Bengali Muslims during the British colonial era. These very “outsiders” morphed into “foreigners” post independence when India was partitioned and East Pakistan came into being. While the demand to protect the indigenous Assamese was raised by organizations like AASU, the BJP gave traction to the perception of how Bangladeshi migrants were entering India in large numbers and how they pose a threat to India. This was essentially now an anti- Muslim campaign. The D voters issue and the NRC by their very criteria of legacy documents set the bar so high and absurd that most citizens can’t prove their citizenship. The question looming large now is how the state intends to approach this vast sea of humanity which will be rendered stateless? But how will the 40 lakh people produce documents in a couple of months when they have eluded them for a few decades? Also how will the state process so many documents in a time effective way? What are the options? Detention camps? Deportation? Will Bangladesh accept them? Refugee camps? Or another massacre? This fear and uncertainty will weigh down heavy on these citizens. It is unfathomable that a semi judicial administrative process is used to uproot and exclude so many citizens from the ambit of citizenship and the related rights. The British colonial officials saw land abundant Assam as a solution to the Bengal problems of growing revolutions, land scarcity and over population. Accordingly, the government proposed to mobilize a section of Bengal people to the neighbouring thinly populated and land abundant state of Assam. This motivation of colonial officials was political balancing of the Hindu-Muslim population of Assam was undoubtedly an attractive tool of colonial political control. The government, thus accepting the proposals of its officials decided to take up a human plantation programme from Bengal to Assam and started giving all round facilities to the poor peasants of the state for coming to Assam and to have settlement there. This policy of shifting Bengal population to Assam aimed at profits for colonial Government. It minimized the problem of over population of Bengal, numerous strengths of the united power of the Bengal population against the British Government weakened; increased population of Assam maximized the collection of revenues of the British Indian Government, etc. Moreover, as eighty five percent of the migrant people from Bengal belonged to Muslim community, and, their settlement in Assam dominated by Non-Muslims created British expectation of communal situation. This large-scale migration was not saluted by a section of the local Assamese people. It was alleged that ‘—alarming rise in the population adversely affected the rural economy of Assam. Mass immigrations in an organized way and occupation of wastelands, grazing and forest reserves, posed a serious problem. Mass squatting as well as the occupation of whole villages at times by the immigrants through the purchase of lands by offering tempting prices to the local inhabitants whose economic difficulties compelled them to part with their land seemed to threaten the survival of the indigenous inhabitants. As public opinion in the rural areas was too feeble and unorganized to focus the magnitude of the problem in its proper perspectives, the immigration issue was steadily assuming a serious turn. Accepting this appeal of the local people, the British Indian Government in 1920 decided to execute the proposed ‘Line System’ of 1914, which was supposed to keep the migrant people aside from the local Assamese people. However, the formulation and execution of ‘Line System’ created a tense, dubious and almost unsolvable problem in the state. It took political turn adding fuel to the growth of communal feelings between the local Assamese and new settled people. The local people, who most of were Hindus, stood for stopping migration from East Bengal and desired a well-planned restriction to the settlement of the migrant people; while the migrant people, of whom eighty five percent were Muslims were looking forward of getting opportunities to find settlement in the available waste lands of the State and stood firmly against the newly formulated Line System demanding its immediate abolition. Thus a tug of war started between the two groups of religious people (Hindus and Muslims) on the question of ‘Line System’, which shattered all Indian politics. During the British period there was considerable migration of poor peasants from Bengal and East-Bengal towards Assam that had changed the demographic pattern of the state. This process of migration though reduced continued from the East-Pakistan and it is also alleged that it has been continuing even from Bangladesh. Thus the ‘migration issue’ turned into ‘foreigner’s’ issue’ in Assam. Now, foreigners’ issue became the prime agenda of the ‘Assam Movement’ (1979-1985) initiated by the ‘All Assam Students Union (AASU) and ‘All Assam Gana Sangram Parishad (AAGSP)’. They demanded the deportation of foreign nationals from the state. During the period of the Movement, without making any statistical data the leaders deliberately exaggerated the number of the foreign nationals in the state. According to Jogen Hazarika (1979), the Chief Minister, the number of foreign nationals in Assam was two lakhs. Two regional parties of Assam- ‘Assam Jatiyatabadi Dal (AJD)’ and the ‘Purbanchaliya Loka Parishad (PLP)’ estimated the number of the foreign nationals in the state at 40 lakhs and 13 lakhs respectively. According to an ideologue of the movement the number of foreign nationals living in the state illegally was 45 to 50 lakhs, out of Assam’s total population of 1,46,25000. Another political scientist estimated the number of the foreign nationals in Assam up to 1981 at 40 lakhs. Another exponent of the movement named Bisweshwar Hazarika, counted the number of foreign nationals in the state at 77 lakhs. The All Assam Students’ Union in one of their publications fixed up the number of infiltrators at over 45 lakhs, of whom over 15 lakhs had entered their names in the electoral roles. If one accepts such fantastic figures, the percentage of foreign nationals would range between 10 to 50 percent of the total population of the state. It seems from the entire mechanism that this time, the long pending NRC of 1951 will get updated as majority of the people have welcomed the process. Still it faces considerable challenges from different angles. The first challenge is to deal the issue of ‘D’ voters of the state. ‘D’ voters’ cases are still pending in the Foreigners’ Tribunals. According to calculations, to settle all the cases that are lying with the Foreigners’ tribunal of the State, it will take more than 92 years with the speed they dispose cases! But the present mechanism of NRC updating process allows the ‘D’ voters’ to apply for inclusion of their names in the updated NRC. However, it is said that those “D” Voter’s name will only be included in NRC after getting clearance from the Foreigners Tribunals. But the way the Foreigners Tribunals are functioning most of the “D” Voter’s will not be able to get their names enlisted in the present NRC. Pratik Hazela, the Co-ordinator of NRC updation works of the state says his office is unable to do any needful steps for the ‘D’ Voters as it is not under its jurisdiction. Thus the “D” Voter’s cases will be shattering Assam politics for another long term. 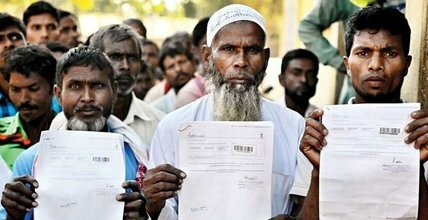 Many of the Bengali Hindus and the Tea Tribes residing in Assam do not have the documents needed for applying in the ongoing NRC. It is now suspected that many labourers of tea gardens came to Assam for settlement after 1971. Though these tea garden labours are Indian, they are not eligible to be enlisted in the NRC. Citizenship of many of the Bengali Hindus is suspected. More often, BJP, the major political party of country declares that the Bengali Hindus should be given the status of Indian citizenship without any question which is not again accepted by other political parties and organizations. In this critical juncture, the All Assam Bengali Youth Student Federation (AABYSF) have opposed the present process of NRC updation. The Federation called for a strike in the state on 17th June 2015 that paralyzed normal life in the state. It demands inclusion of the names of all Hindu Bengalis who migrated from Bangladesh to Assam in the NRC. They also demanded that all Hindu Bengali detainees should be released from detention camps without any condition. During the 12-hour bandh, buses and other vehicles did not ply and streets wore a deserted look. Government offices, banks, schools, colleges along with other institutions remain closed. The role of present AASU leaders is also dubious with NRC process in Assam. In the present system of NRC updation many Indian citizen residing in Assam do not have any of the listed documents to produce for enlisting names in the NRC. Even many Assamese people were living outside Assam between 1951 to1971 and thus their names are not available in any of the documents. Their descendents are now facing problems in the process of NRC updation.